The Drukpa (Tib. druk «dragon», pa «school») is a major sect within the Kagyupa school of Tibetan Buddhism. It is the largest school of Buddhism within Bhutan (the second being the older Nyingma school). 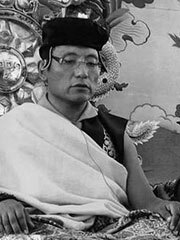 Drukpa also refers to the reincarnated founder of the sect, known the Gyalwang Drukpa, who is now recognized in his 12th incarnation. The Drukpa school was founded in western Tibet by Tsangpa Gyare (1161-1211) who mastered the Tantric Buddhism practices of the Mahamudra and Six yogas of Naropa at an early age. As a terton, or finder of spiritual relics, he discovered the text of the Six Equal Tastes, previously hidden by Rechungpa, the student of Milarepa. While on a pilgrimage Tsangpa Gyare and his disciples witnessed a set of nine dragons roaring out of the earth and into the skies, as flowers rained down everywhere. From this incident they named their sect Drukpa (from the Tibetan druk «dragon», pa «school»). A prominent disciple of Tsanga Gyare was Phajo Drugom Shigpo (1208-1276) who went on to convert the valleys of western Bhutan to Drukpa Buddhism in 1222. In the 1600s Shabdrung Ngawang Namgyal, the founder of Bhutan, unified the country and established Drukpa as the preeminent Buddhist school from Haa all the way to Trongsa. Inside Bhutan the sect is led by the King of Bhutan and Je Khenpo (a title of office, not a tulku lineage), who is the chief abbot of the Central Monk Body. Both are lineage holders of the Drukpa school. Outside of Bhutan the order is led by Djigme Padma Aungchen, the 12th Gyalwang Drukpa.